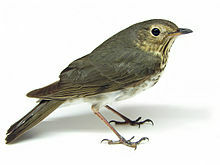 If Bamfield, British Columbia ever decides to choose an official Town Bird, I would suggest the Swainson’s Thrush. In summer, the place resounds with their melodious song. Here is another video, from Squamish, B.C. 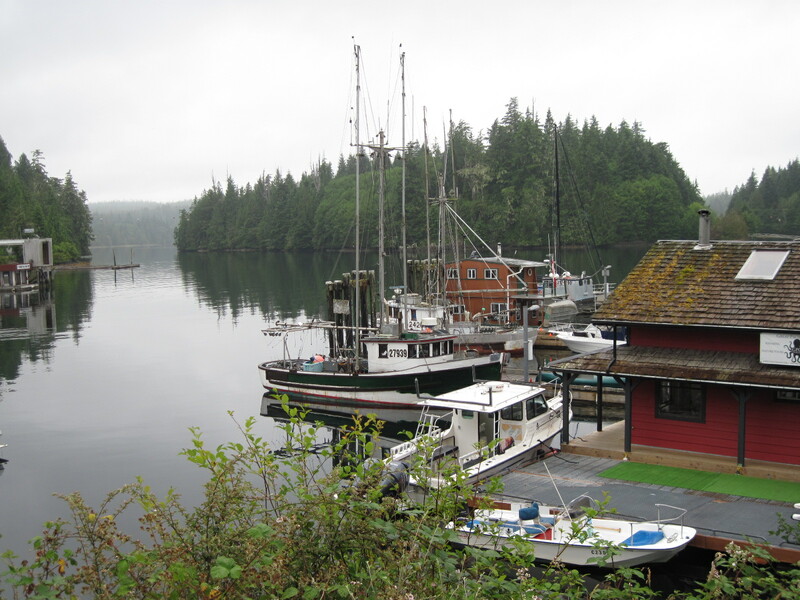 Bamfield is a community of a couple hundred permanent residents on the far west coast of Vancouver Island. 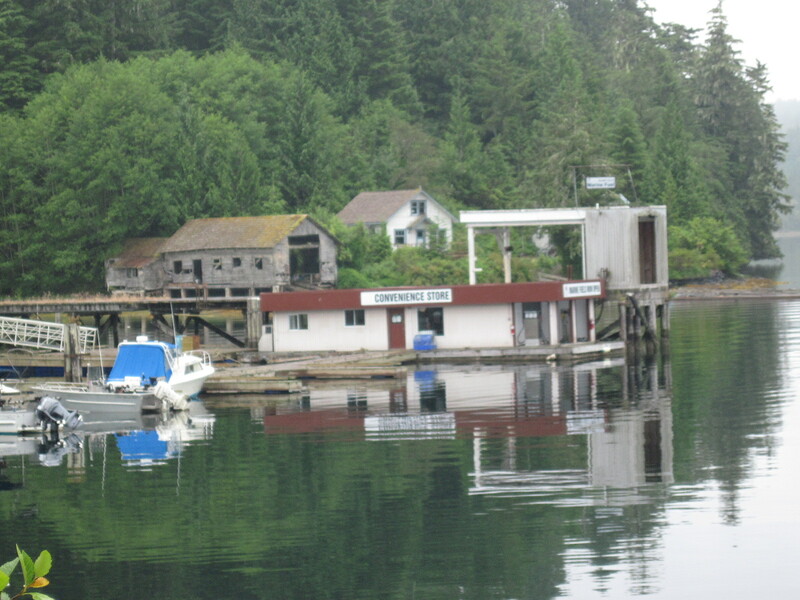 It occupies both sides of Bamfield Inlet, which divides the town into East and West Bamfield. 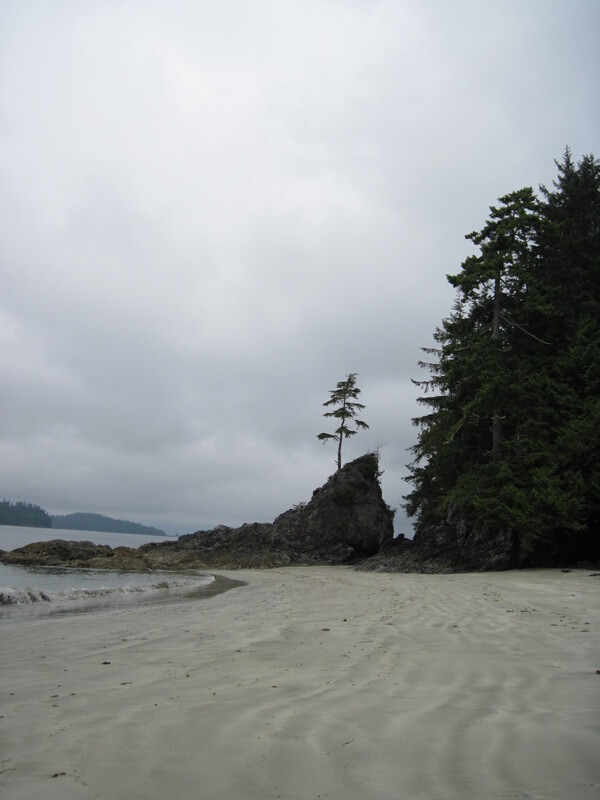 The coastal rainforest comes down nearly to the water, providing a good habitat for the Swainson’s thrushes, who prefer closed-canopy forests. 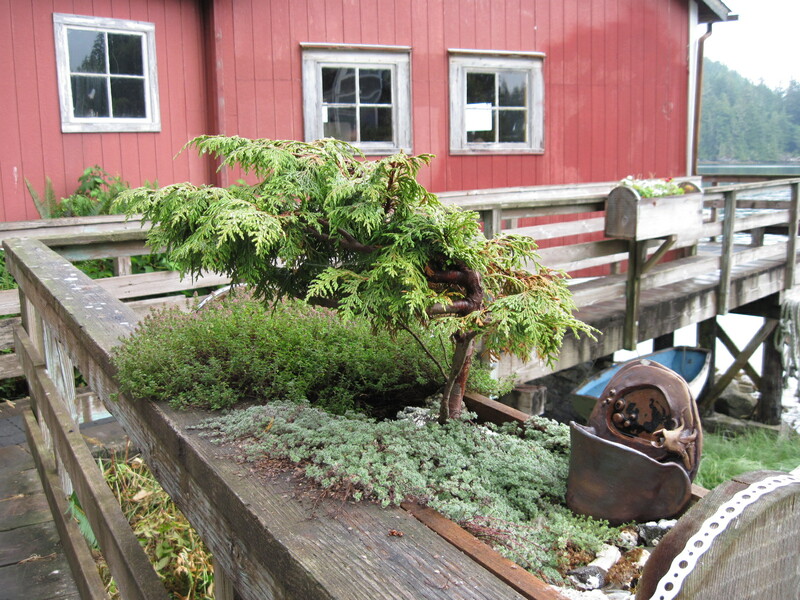 It’s all the human inhabitants can do to beat back the lush vegetation. Part of the shore at East Bamfield, with forest close behind. 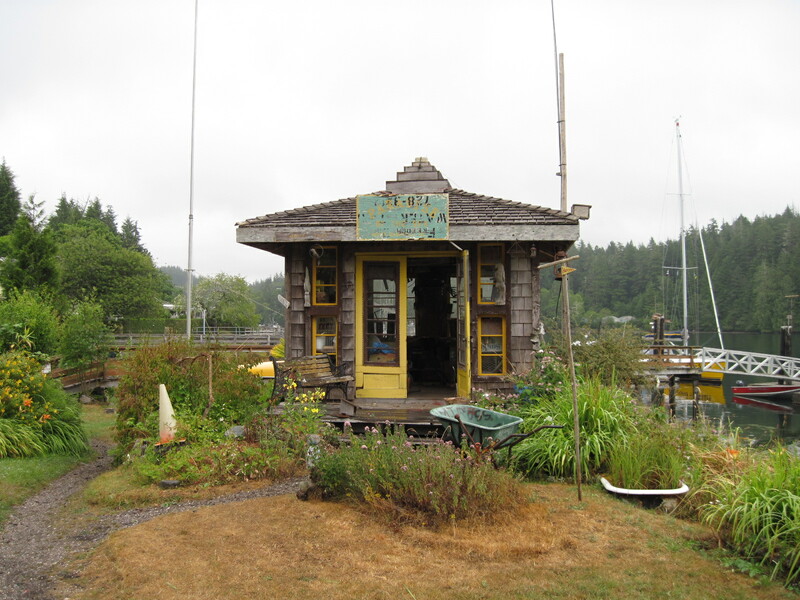 A row of charming old houses and shops lines the boardwalk along the shore of West Bamfield. Many of the houses have attractive gardens. 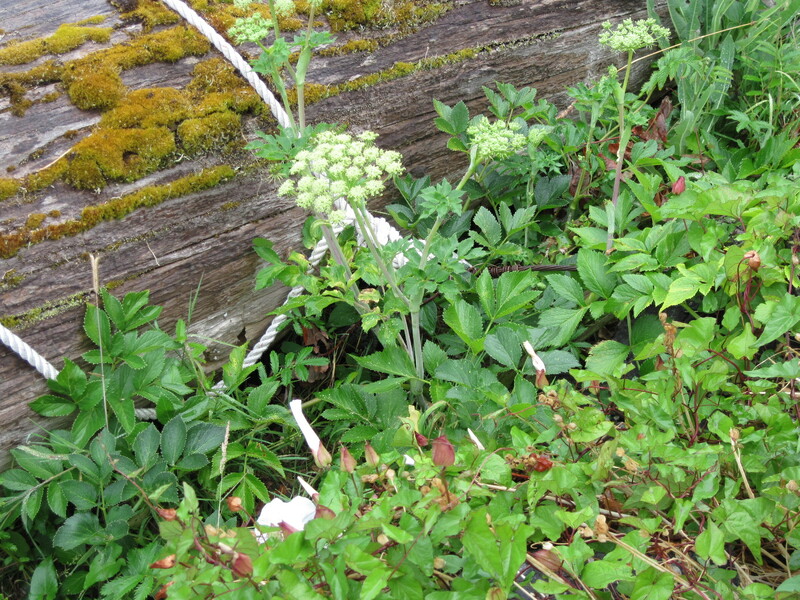 Even the weeds are beautiful in their wild lushness. Captivating sights are found around every corner. 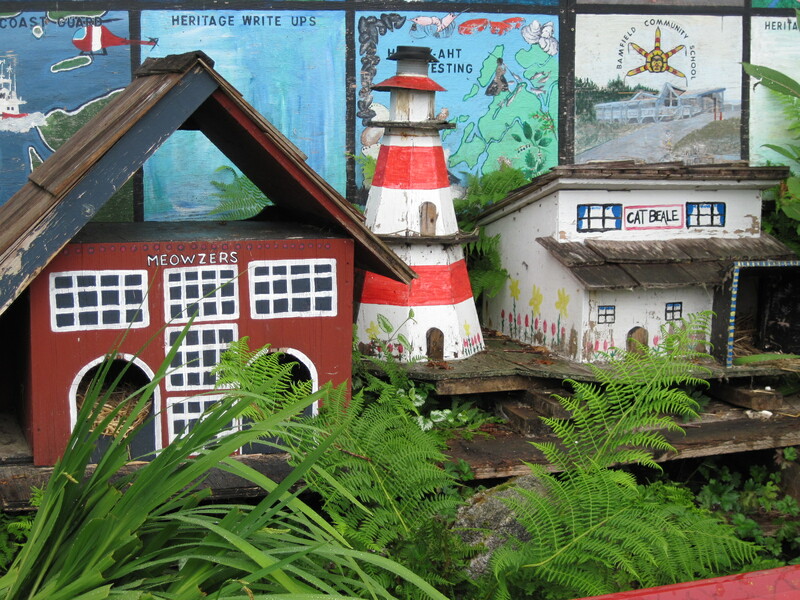 One of the quirky features is the Cat Haven, a set of shelters for feral felines that were live-trapped, neutered or spayed, and then returned to live out their days in these charming cat houses. 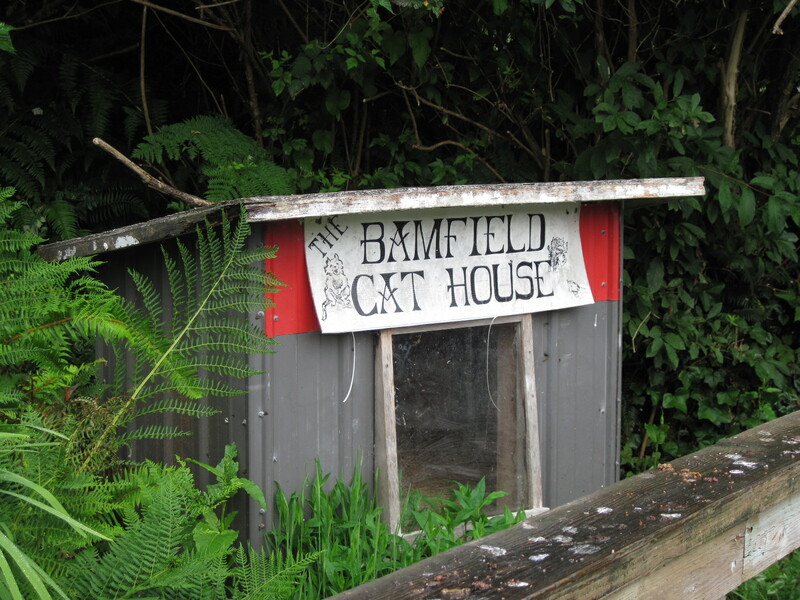 The population control process must have been very effective; we saw not one cat anywhere during our stay. 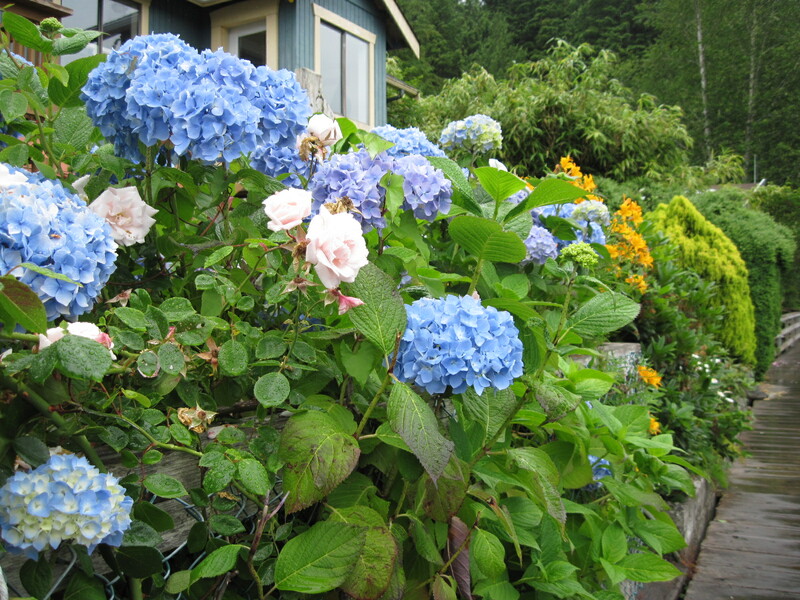 The best reason for a trip to Bamfield in July is Music By The Sea, a unique music festival in a special place. 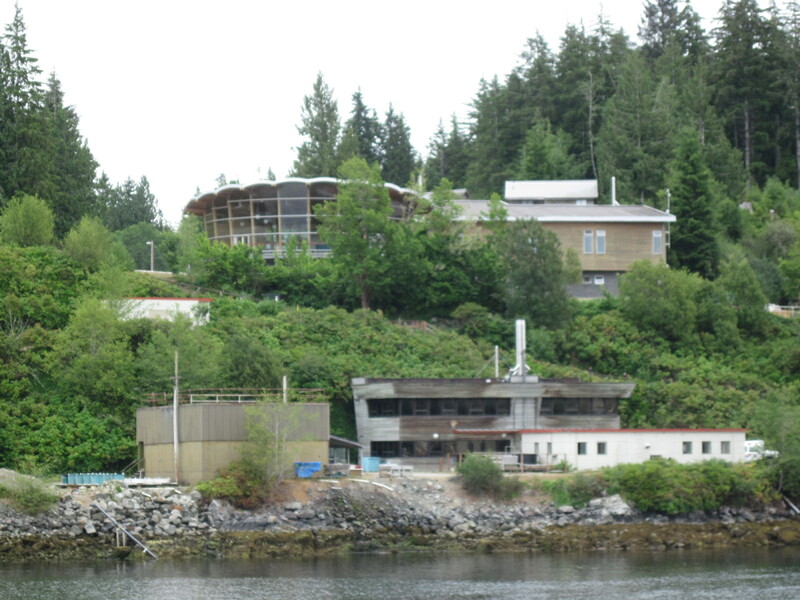 The repertoire is classical and jazz, the musicians come from all over North America, and the venue is perfect — a small auditorium that’s part of the Bamfield Marine Sciences Centre. Music By The Sea concerts are held in the building with the scalloped roof. Imagine, if you will, wide windows overlooking ocean and islands, fronted by musicians plying their trade, playing chamber works by composers from J.S. Bach to Alexander von Zemlinsky, or improvising on tunes by Billy Strayhorn, Nat Adderley or Jay Livingston. 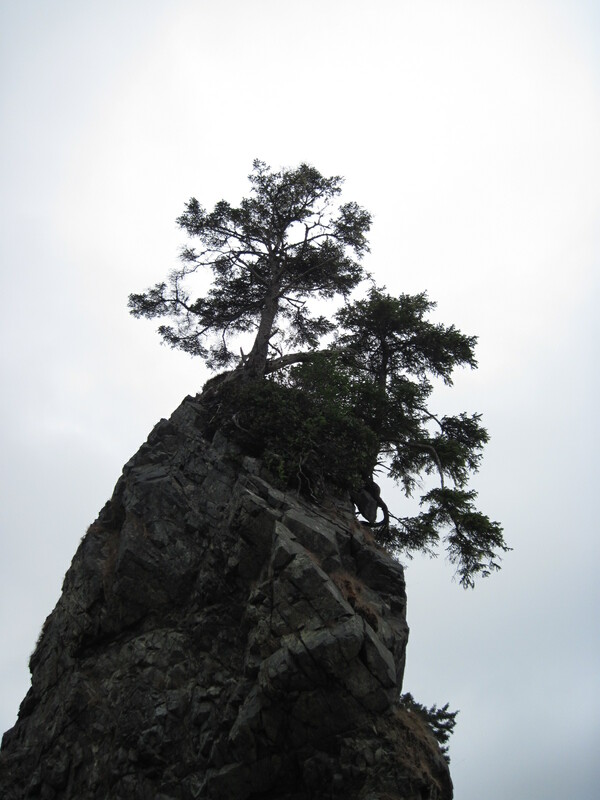 Imagine mezzo-soprano Nan Hughes singing Debussy’s Ariettes oubliees, or pianist John Stetch reinterpreting “Never Let Me Go.” Then intermission on the balcony as the summer light slowly fades, and the Swainson’s thrushes call back and forth across Bamfield Inlet. 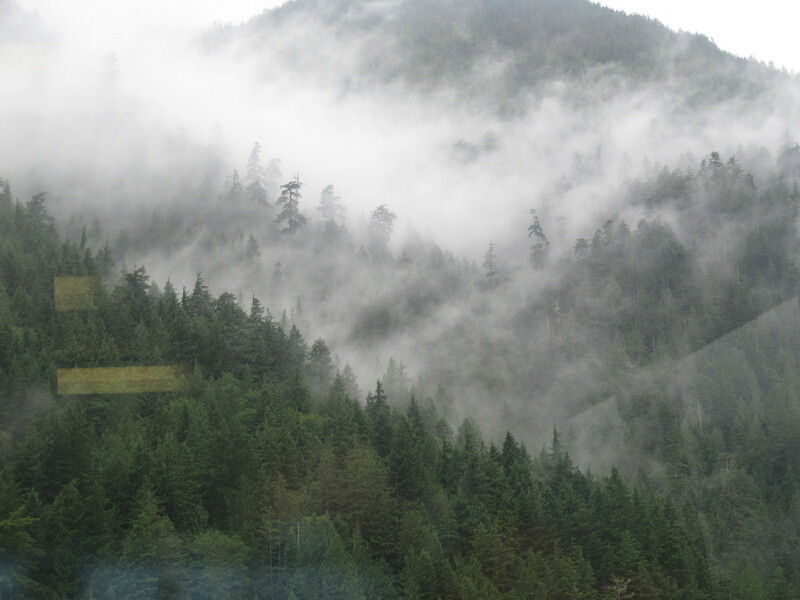 You can get to Bamfield by logging road from Port Alberni (a distance of fewer than 100 km or 60 miles, but it can seem a lot longer if you don’t have the right sort of vehicle and aren’t used to potholes, dust and huge logging trucks barreling along). 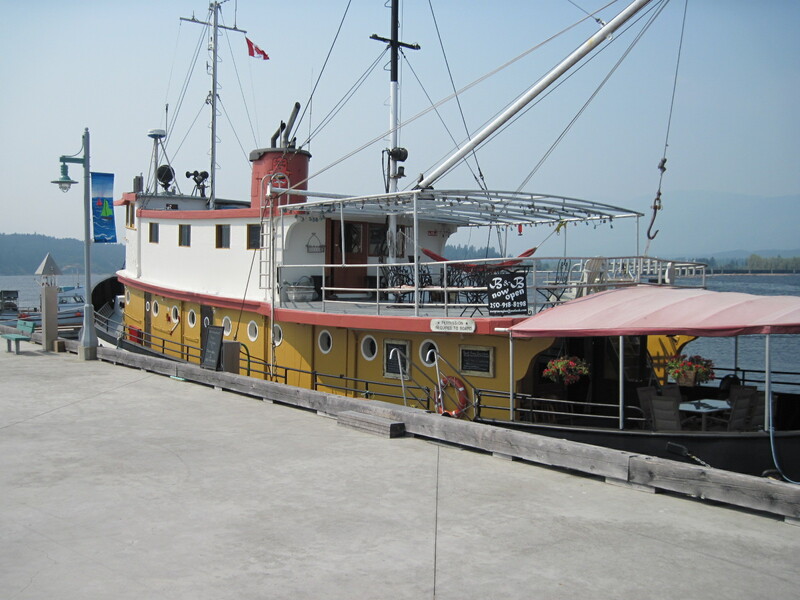 Or you can take the Frances Barkley, a ship that carries passengers and freight, operated by Lady Rose Marine Services out of Port Alberni. 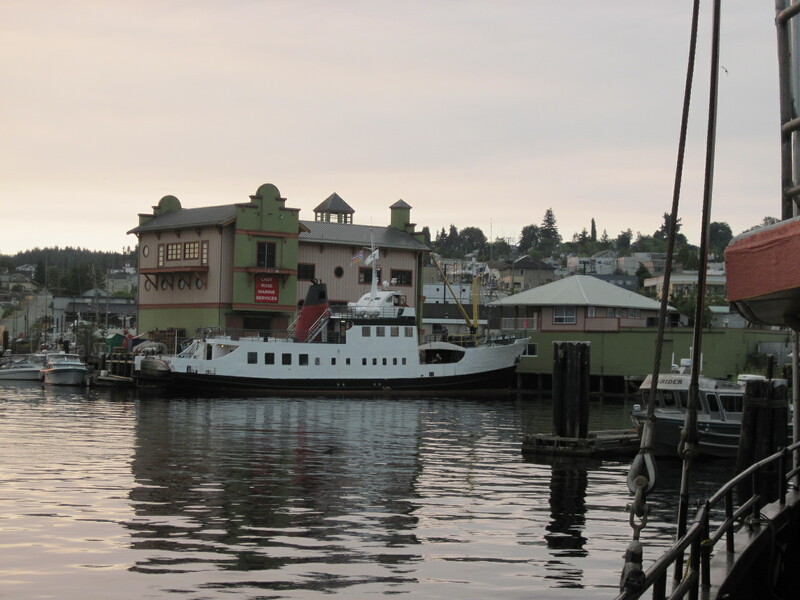 Side note: because the Frances Barkley departs at 8 in the morning, we spent the previous night at the Swept Away Inn, a conveniently located and unusual B&B that used to be a working tugboat, moored at the Port Alberni waterfront. Snug but comfortable quarters and an excellent breakfast. A pleasant four hour cruise takes you down Alberni Inlet, where you will see fishing boats, log booms, forests, mountains, eagles and (if you’re lucky; we weren’t) whales. 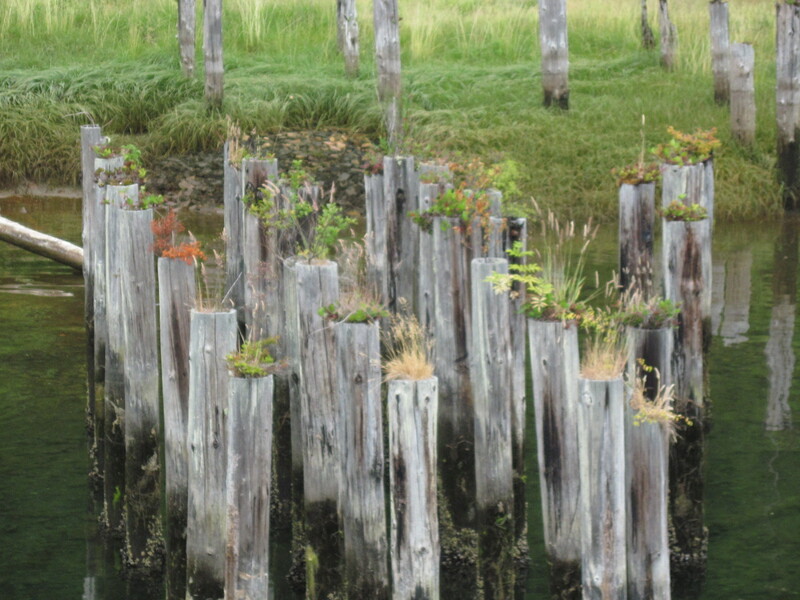 …and a garden of plants growing out of old pilings. 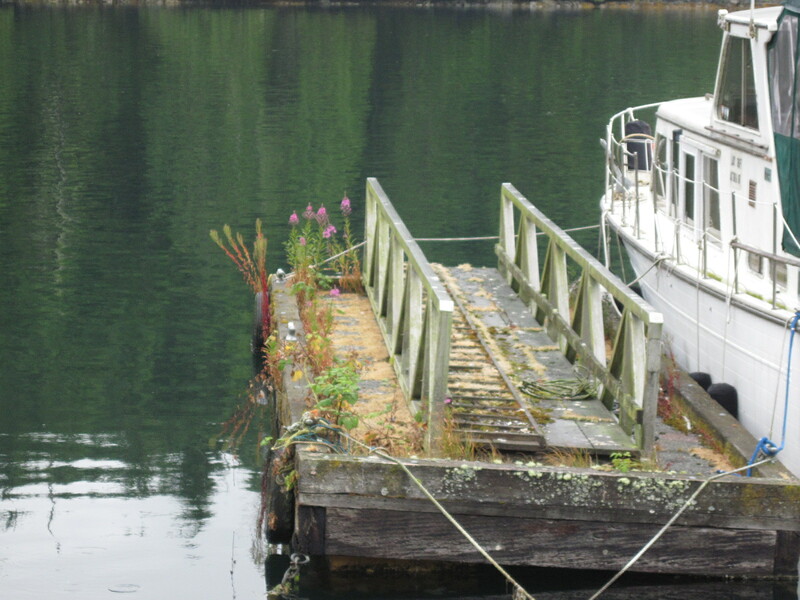 On arrival in Bamfield, you get to watch cargo being unloaded using the ship’s crane, a fascinating operation. Then (if you’re doing the day trip), you get an hour and a half to explore the boardwalk, check out the general store and coffee shop, buy some ice cream, take some pictures. 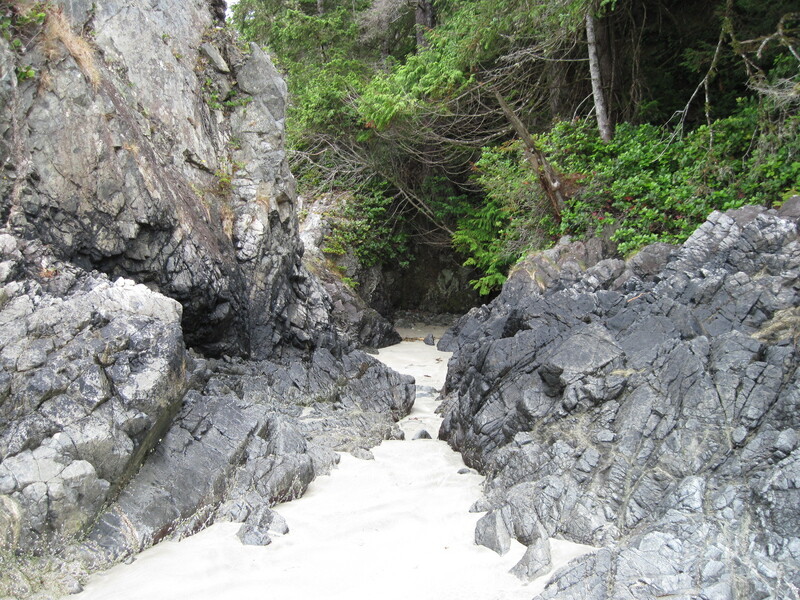 If you’re staying for a couple of days, you can take a water taxi to East Bamfield, or walk along a couple of kilometers of gravel road to Brady’s Beach, a typical lovely beach of the area, complete with sea stacks, grottoes and (almost) white sand. All this and music too! Definitely a worthwhile trip. Has a Nordic look and feel to it. I suppose it does, now that I think about it. 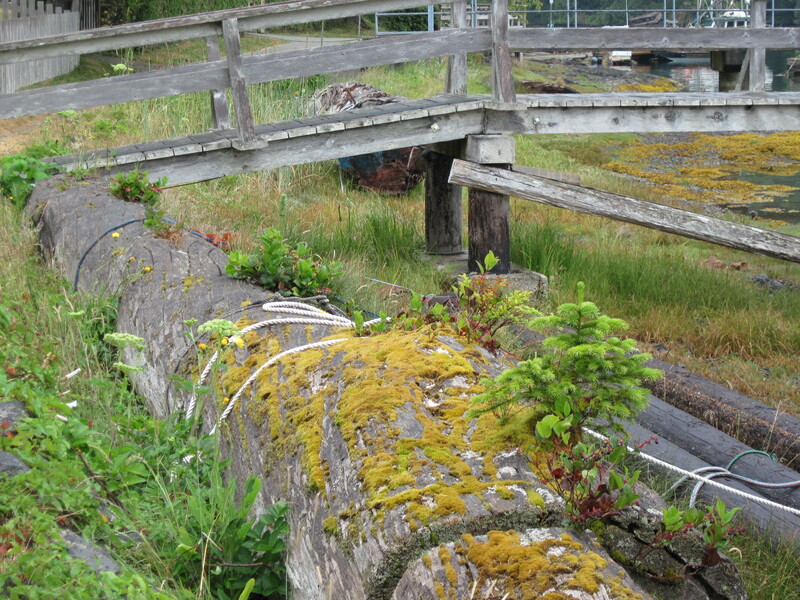 There are a lot of fjord-like inlets on the BC coast. 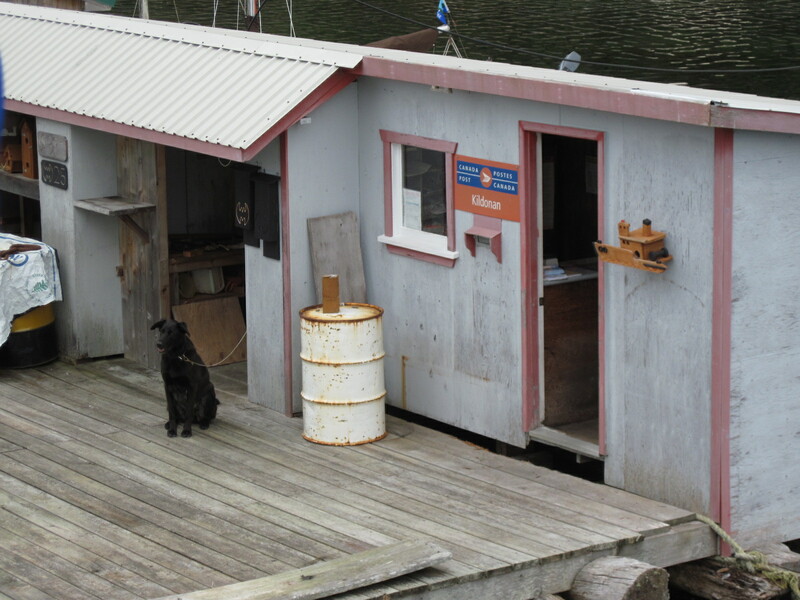 Fishing is a big thing, and I seem to recall some of the early settlers in Bamfield were from Sweden.